Our latest proofreading project is an unusual item from prolific dime novel publisher J. S. Ogilvie: White Dandy; or, Master and I. A Horse’s Story. 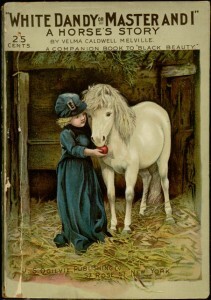 This book, a self-described “companion to Black Beauty” follow’s that classic’s basic format, using a horse as a narrator and serving as a condemnation of animal cruelty. A quick glance through the pages reveals some rather graphic violence, so this may not be the cute children’s book that the cover suggests. Stay tuned for a closer analysis once the project completes and we are able to read the full text.